It’s time for a lesson in tax economics. Though hopefully today’s topic won’t be as dry and boring as my missives on more technical issues like depreciation and worldwide taxation. That’s because we’re going to talk about the taxation of workers, which is something closer to home for most of us. And our lesson comes from Belgium, where the government wants a “new social contract” based on lower “direct” taxes on workers in exchange for higher “indirect” taxes on consumers. Here are some excerpts from a Bloomberg column by Jean-Michel Paul. Belgium’s one-year-old government announced measures, radical by that country’s standards, to move the burden of taxation to consumption from labor. The measures are being hailed as the start of a new social contract in the heart of Europe. But before discussing this new contract, let’s look at how Belgium’s system evolved. Monsieur Paul explains that his nation has a bloated welfare state, which has resulted in heavy taxes on workers (vigorous tax competition precludes onerous taxes on capital). …In order to sustain large government expenses of more than 50 percent GDP on top of servicing its debt, Belgium became the OECD’s second most-taxed economy. 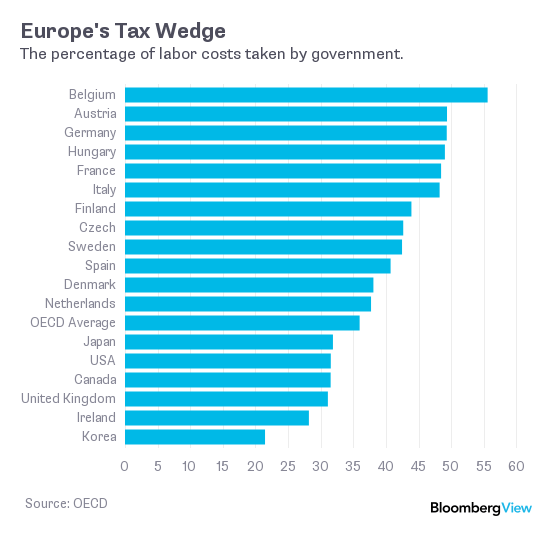 …Belgium made a choice: It decided to heavily tax labor, which it figured, wrongly, was stuck. At the same time, it decided to provide attractive tax treatment to highly mobile capital. The gambit meant that Belgium attracted a large number of wealthy families from higher tax countries, particularly France and the Netherlands, eager to take advantage of the low rates of tax on capital. However, Belgian workers got hammered. In 2014 Belgian workers were the most taxed labor in the developed world, taking home only 46 percent of employers’ labor costs. Here’s a chart from the article, showing that Belgian workers are the most mistreated in the developed world. Keep in mind, by the way, that average rates only measure the overall burden of taxation. Marginal tax rates, which are what matters most for incentives, are even higher. According to Wikipedia, the personal income tax has a top rate of 50 percent, and that punitive rate hits a lot of ordinary workers (it’s imposed on income “in excess of €37750”). But there’s also a 13 percent payroll tax on workers and a concomitant payroll tax of more than 30 percent on employers (which, needless to say, is borne by workers). Not surprisingly, high tax rates on labor have led to some predictably bad consequences. The entrepreneurial class is voting with its feet and regular workers are being taxed into the unemployment line. Given these horrid numbers, it’s understandable that some policy makers in Belgium want to make changes. But as Americans have learned (very painfully), “change” doesn’t necessarily mean better policy. So let’s see what Belgian policy makers have in mind. The new policy…is to reduce taxes on labor and increase indirect taxes to compensate. Social Security taxes on companies are being reduced to 25 percent from 33 percent over the next two years, bringing an increase in the net after-tax income of 100 euros ($113) per month for low and middle-wage earners. This is mainly financed by an increase in value added tax on electricity consumption. …Belgium is the first to implement what some call a “social VAT” (a tax on consumption to finance social security). …it rewards work and may well change the entitlement mind-set that has hampered innovation and job growth for decades. …a significant step in the right direction, correcting some of the worst distortions of Belgium’s social model. In other words, politicians in Belgium want to rearrange the deck chairs on the Titanic. Workers will be allowed to earn more of their income when they earn it, but the government will grab more of their income when they spend it. Now for the economics lesson. Now ask yourself whether the change in Belgian tax policy will boost employment when there’s no change in the tax wedge between pre-tax income (the income you generate) and post-tax consumption (the income you get to spend)? The answer presumably is no. This doesn’t mean that the proposed reform is completely useless. It appears that the VAT increase is achieved by ending a preferential tax rate on electricity consumption. And since I don’t like distorting tax preferences, I’m guessing the net effect of the overall package is slightly positive. In other words, the lower payroll tax rate is unambiguously good and the increase in the VAT burden is only partially bad (I would be more critical if the proposal included an increase in the VAT rate rather than the elimination of a preference). That being said, now let’s address Belgium’s real problem. Simply stated, it’s impossible to have a good tax system when government spending consumes more than 50 percent of economic output. In no uncertain terms, an excessive burden of government spending is the problem that needs to be solved. P.S. Interestingly, Belgium’s tax shift is somewhat similar to Rand Paul’s tax plan. In addition to all the other changes envisioned by the Kentucky Senator, he would get rid of the payroll tax and replace it with a value-added tax. P.P.S. In addition to much smaller government, I suspect Belgium also needs to split into two different countries. P.P.P.S. To get an idea of Belgium’s challenge, the politicians in Brussels actually criticize Germany for being too capitalistic. Cut spending, yes. Increase deficit spending, no! Why is it that these all knowing Congressmen can’t see the forest for the trees? The answer is so simple that it is embarrassing! Just kill the sacred cows: the central governments intrusion in the field of medicine and the con game that the Saudis and Chinese are playing with the American people. •	Repeal Obamacare, post haste….why spend a trillion dollars to buy health care for the 32 million Americans who are currently receiving it for free right now? Simply include the preexisting disease and 26 year old child clauses of Obamacare and trash the other 2300 pages of this pay to play scam. •	Give current Medicaid and Medicare recipients vouchers and let them purchase whatever health insurance fits their needs…this would cut the cost of these corrupt programs by an amazing 70%. Enforceable, meaningful deductibles and co-pays would return Medicare and Medicaid patients to the real world medical marketplace! And would simultaneously cut the cost of commercial health insurance for the rest of us by 50%. •	Scrap the phony trillion dollar Medicare prescription drug program. This was a tradeoff by Bush and Cheney, aimed at getting old folks and big Pharma ’ Brownie Points, so that Bush, Rice, Cheney and Rumsfeld not be put on trial for treason vis a vis their phony wars in Iraq. Let the seniors buy the safer, much less expensive generic drugs. •	Conduct an auction and sell off all government hospitals….Army. Navy, Air Force, VA, USPHS and NIH. Then present the involved patients with vouchers, so that they can seek medical care wherever they wish. Private hospital corporations would buy the above mentioned facilities and run them as they should be run. Thereafter, patients would be required to pay deductibles and co-pays, just like the rest of us! Many of these patients would continue to use the same government doctors and government hospitals, albeit in a more responsive, business like environment. •	Issue a federal mandate that would allow patients to cross state lines, in order to purchase more competitive health insurance….in other words, break up those BCBS monopolies, like the BCBS scam that Kathleen Sebelius and her trial lawyer cronies ran in Kansas, for years and years. •	Scrap the wind farm and gasohol programs that our corrupt politicians and their flim flam puppeteers have forced down our throats. These programs are not, and never will be, cost effective. •	Structure gasoline and diesel road taxes so as to encourage the use of our abundant natural gas resources for surface transportation. •	Remove all unions from all mass transit in America. Tell the mass transit employees that efficient, privately run mass transit, free of unions, is a matter of national survival. •	Call a halt to the phony war on drugs and the corrupt judicial-prison industry that it supports. Make those government judges, lawyers, DEA, Sheriff’s Deputies, FBI, USMS, local and federal judicial employees who are involved in this phony war on drugs…why, make them go out and get real jobs. Fail to do so and we will continue our ever accelerating national slide into the dark abyss. To be sure, the answer is not to increase taxes and to further squeeze grandma’s money market funds and CDs. Nor grandpa’s little social security check. What becomes obvious is that human nature is always the same. It is no wonder that an “entitlement” attitude becomes prevalent. Those who would have otherwise invested their money that was taken as tax then feel entitled to the “reward” that is guaranteed by that same tax system upon retirement. SO, the system itself perpetuates the entitlement society by convincing them that they should recoup some of their earlier investment- just as you would do if you had been able to invest it into a private fund. Is the percent of GDP controlled by government going to change under the new tax system? Therefore Belgians will continue to work the same proportion of their each and every single day for distant unknowns. The unknown voters that impose Belgian levels of taxation on them. Their fellow countrymen. The government apparatus middlemen (and women), politicians and government employed bureaucrats is more than happy to tap into a significant portion of this transfer to live off political management fees. Life and decline in worldwide prosperity rankings will go on in Belgium, while hope of improvements under a new pimp contract will keep Belgian voter-lemmings busy for a while. Meanwhile, Belgians at a 1% annual growth trendline are being fast absorbed into the group of middle income nations, as the world as a whole grows at four percent. At a -3% growth deficit it won’t take long to compound away the wealth rankings that Belgians accumulated during freer times. The cherished Belgian government services of today will be just typical middle income nation government services of 2050. The way we look upon at the government services of Mexico, Turkey and Romania today. And climbing out of that situation will be impossible for the deadlocked electorate. Who will give up his government services first? Nobody. When your voters are lemmings, there is little hope. Democracy looses its advantage. Even Russian prosperity is converging towards Belgium. The process looks very slow in the cacophony and preoccupations of daily life, economics and politics. But on a historical time scale a -3% growth deficit compared to world average is a precipitous decline. By 2050 Belgium will be a middle income country. On a one percent growth trendline, a 21st century country is in fast decline. The arithmetic of exponents doesn’t really care whether is a democracy or not. Seems like for the lower and low-mid class the changes may be a wash. But for the more productive (to the extent that some, albeit weaker, correlation between exceptionalism and reward still exists in Belgium) seems like taxes will go up — giving Belgians another chance to flatten their effort-reward curve even further. If you have to penalize exceptionalism to subsidize mediocrity, then you get a lot of mediocrity and little exceptionalism, a one percent growth rate, and a three percent annual growth deficit compared to world average, which quickly compounds your country into the middle income nations of this world. Saving may go up a bit, as some Belgians put away more money to spend later when they can finally leave Belgium some day — and take their money with them — if taking money out is still allowed by then. Because coercive collectivism and the decline it triggers quickly become a vicious cycle. Have you noticed how many retired (often quite early) Europeans one finds in places like the Caribbean? European tax refugees are rapidly becoming more and more common in larger and larger swaths of this world. Many don’t even classify themselves as tax refugees. They simply do the calculation, “it’s cheaper here, my euro goes further here, and if I get sick I can always go back to European taxpayers while I’m undergoing treatment”. Many are in essence tax refugees while remaining ideologically attached to their fifty percent socialist societies. They are lucky because this will not last long. On this trajectory, in two to five decades virtually all European countries will have been reached by the middle income world. I know it’s difficult for Americans to accept that they are on a trajectory that is only marginally better. It is difficult because the tremendous endowment of freedom early Americans injected into this nation lasted a long time, and allowed Americans to grow faster than the world average for nearly two centuries. Americans got used to it and are still taking it for granted. But now seems like ideological and electoral convergence has finally caught up with Americans. A secular two percent growth rate in a world that is growing by four percent will not take long to undo prosperity rankings. Backtracking from there will be virtually impossible. America’s trajectory may be better than Belgium and most European countries. But it is simply a slower descent. The end destination is the same: Decline. I do NOT feel sorry for those regular workers on the unemployment line. They voted for that.